Teeth are naturally strong and durable — if we can prevent or control dental disease like tooth decay or gum disease, they can last a lifetime. Still, teeth do wear gradually as we age, a fact we must factor into our dental care as we grow older. 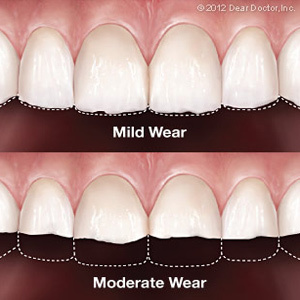 Sometimes, though, the wear rate can accelerate and lead to problems much earlier — even tooth loss. There are generally four ways this abnormal wear can occur. Tooth to tooth contact. Attrition usually results from habitual teeth grinding or clenching that are well beyond normal tooth contact. Also known as bruxism, these habits may occur unconsciously, often while you sleep. Treatments for bruxism include an occlusal guard worn to prevent tooth to tooth contact, orthodontic treatment, medication, biofeedback or psychological counseling to improve stress coping skills. Teeth and hard material contact. Bruxism causes abrasion when our teeth regularly bite on hard materials such as pencils, nails, or bobby pins. The constant contact with these and other abrasive surfaces will cause the enamel to erode. Again, learning to cope with stress and breaking the bruxism habit will help preserve the remaining enamel. Chronic acid. A high level of acid from foods we eat or drink can erode tooth enamel. Saliva naturally neutralizes this acid and restores the mouth to a neutral pH, usually within thirty minutes to an hour after eating. But if you’re constantly snacking on acidic foods and beverages, saliva’s buffering ability can’t keep up. To avoid this situation, refrain from constant snacking and limit acidic beverages like sodas or sports drinks to mealtimes. Extreme cases of gastric reflux disease may also disrupt your mouth’s pH — seek treatment from your medical doctor if you’re having related symptoms. Enamel loss at the gumline. Also known as abfraction, this enamel loss is often caused by receding gums that expose more of the tooth below the enamel, which can lead to its erosion. Preventing and treating gum disease (the leading cause of receding gums) and proper oral hygiene will lower your risks of receding gums and protect tooth enamel. Who knew saliva was so important? At All Smiles in Worth, we are interested in more than just your dental health. We also care about your overall health as well. That is why we offer salivary diagnostics, an important and emerging health care tool. Salivary diagnostics is still early in development, but it has a very exciting potential for detecting diseases quicker than traditional methods of disease detection. The earlier a disease or condition can be found, the quicker treatment can begin, potentially saving your life. What are the Benefits of Salivary Diagnostics? The benefits of salivary diagnostics are very exciting! When you compare saliva collection versus blood collection, collecting saliva is easier and painless because you don't have to get stuck with a needle. Collecting saliva instead of blood does not expose the healthcare worker to potentially dangerous blood-borne diseases. Also, collecting saliva is cheaper than collecting blood. Storing the collected saliva is easier because it doesn't need to be manipulated like blood to keep it from clotting. Why is Salivary Diagnostics Important for Preventive Care? Saliva has been called the "mirror of the body." Tests on saliva can catch the presence of some diseases before other methods of detection. Saliva testing can also be used to follow the progress of certain diseases. While this technology is still very early in development, salivary diagnostics has the potential to detect a wide range of diseases and conditions. These include: autoimmune diseases, systemic diseases, hereditary diseases, cancers, hormone levels, alcohol and drug use, infections, HIV status, and other viral illnesses. Salivary diagnostics can be used as an educational tool in oral hygiene guidance. Finally, saliva testing can reveal a wide range of diseases of the mouth. Call All Smiles for Salivary Diagnostics Testing today! Are you interested in learning more about salivary diagnostics and what it can do for you? Contact All Smiles in Worth at (708) 448-0333 today to make an appointment. We will gladly discuss this cutting edge technology with you. Are you a patient of All Smiles? If so, we would love to hear about your experiences below!